CipherLab Signs with EET Europarts for New Push in Europe - CipherLab Co., Ltd.
Düsseldorf Germany, 11. April 2017 - The newly signed distribution agreement makes CipherLabs´s comprehensive product range available for resellers via EET Europarts´ sales offices in the UK, Ireland, DACH, Benelux, French speaking Africa and in the Nordics. "We are delighted to team up with EET Europarts, who will be able to bring our products to the notice of Europe's specialist auto-ID and data capture resellers and system integrators," says Vita Chang, Director at CipherLab Europe. "Our reseller partners will benefit from locally-based industry expertise and fast fulfilment thanks to EET Europarts´ sophisticated international logistics centre in Denmark." 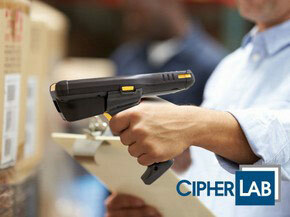 CipherLab's expertise is at the convergence of scanning, mobile computing, and business process design. The company provides everything needed to solve AIDC needs - including quality hardware with custom software for almost every application. "CipherLab is an exciting addition to our AIDC offering," says Richard Gregoire, EMEA Director, POS & Auto-ID at EET Group. "Our extensive channel reach will be a key asset in CipherLab's European growth programme, and CipherLab´s new Android-based enterprise devices are sure to be a massive hit within our international reseller community." CipherLab´s product range and software solutions are distributed by EET Europarts in the UK, Ireland, DACH, Benelux, French speaking Africa and in the Nordics.